Chapter 21, beginning in verse 1 with the earth made new, then, in verse 2 looks back retrospectively to depict the holy city descending from God out of heaven before it was made new! Chapter 20, beginning with the initiation of the “thousand years” on earth with a brief look in heaven during the thousand year assesory judgment, jumps ahead to the post millennial assault against the holy city by Gog and Magog that succeeds the “little season” (Revelation 20:3) transpiring sometime after the holy city actually settled on earth. If John were writing according to the sequence we usually expect, much (but not all) of chapter 20 should have succeeded chapter 21! But, that is John’s style of writing which often brings confusion to the western mind while it was not at all confusing to his fellow believers at that time. Be-that-as-it-may, this chapter begins where chapter 21 left off. Never-the-less, it too will move back retrospectively to remind us of some important things we should never forget even at this present time. One thing the student of Revelation needs, is flexibility of mind! Verse 1: And he shewed me a pure river of water of life, clear as crystal, proceeding out of the throne of God and of the Lamb. The pronoun “he” is still “one of the seven angels which had the seven vials full of the seven last plagues” who “carried [John] away in the spirit to a great and high mountain” so he could watch “the holy Jerusalem, descending out of heaven from God” (Revelation 21:9, 10). John and the angel are probably still together on the top of the “great and high mountain” where the angel carried him (Revelation 21:10), pointing out the various wonders of the city. His tour continues to the fifth verse of this chapter. Although the exact position of “the throne of God and of the Lamb” is not specified, we can imagine, according to the dimensions given in the last chapter, it is located on the top elevation of the city, at least 750 miles up into space! Coursing down the side of the mountain is this marvelous, sparkling “river” “proceeding” directly “out of the throne of God” as its source. All this must have been taking place even while the city was “coming down from God out of heaven” (Revelation 21:1). If the city were cubical, it would be a waterfall rather than a river. Note it was not only “the throne of God” the Father but also “of the Lamb” who says previously He is “set down with [His] Father in his throne” (Revelation 3:21). At this point, the city must have reached the earth for it seems less probable that the “tree of life” would be growing up along side the gushing river on the steep sides of the immense city. It seems more likely that the “river of water” would be emptying into the “sea of glass” (Revelation 4:6; 15:2) that surrounds the bottom of the city either inside or outside the walls with the “tree of life” growing on both sides of the river as it makes its peaceful way into the sea. But, of course, this picture is probably flawed because “Eye hath not seen, nor ear heard, neither have entered into the heart of man, the things which God hath prepared for them that love him” (1 Corinthians 2:9). Never-the-less, John may have seen the city, even during its descent stage, in a “Garden of Eden” setting. We are told, even though the “Garden of Eden remained upon the earth long after man had become an outcast . . . When the tide of iniquity overspread the world, and the wickedness of men determined their destruction by a flood of waters, the hand that had planted Eden withdrew it from the earth. But in the final restitution, when there shall be ‘a new heaven and a new earth (Revelation 21:1),’ it is to be restored more gloriously adorned than at the beginning.” What could “more gloriously” adorn Eden then the holy city? The tree, “which bare twelve manner of fruits” and yielding them “every month,” is extraordinary. The trees we are familiar with bare only one manner of fruits yielding them only once a year. Even “the leaves of the three were for . . . healing of the nations,” the “great multitude, which no man could number, of all nations, and kindreds, and people, and tongues . . .” (Revelation 7:9) who were resurrected in the “first resurrection” (Revelation 20:5,6) in addition to those who were translated without seeing death who came “out of [the] great tribulation” (Revelation 7:14). When God stationed “at the east of the garden of Eden Cherubims . . . a flaming sword which turned every way, to keep the way of the tree of life” (Genesis 3:24) it was an act of mercy to protect man from becoming an immortal sinner, a punishment far worse than death. If they were immortal, they would create their own “eternal torment,” their very own, never ending hell. Adam and Eve, God’s first “servants” chose to be employed by the serpent. Although regretting their choice, there was little they could do to stem the downward spiral of their descendants into perdition. Satan mockingly sneered that God would lose the battle for humanity. Even though a few have chosen to be God’s “servants,” Satan determined he would soon eradicate even those few leaving none to serve God. But, says the Lord, even though He will have to “cut off” two parts of humanity, He promises to “bring the third part through the fire” (Zechariah 13:8,9), the “great multitude, which no man could number, of all nations, and kindreds, and people, and tongues” who will come “out of [the] great tribulation” (Revelation 7:9, 14) that Satan declares none “will be able to stand” (Revelation 6:17) or survive. Of all the wondrous things the angel showed John, to actually see God’s “face” is the greatest wonder of them all! Job anticipated that moment saying even “though after my skin worms destroy this body, yet in my flesh shall I see God” (Job 19:26). David, after alluding to the vain hope of those who live only to fill their “belly” then end up leaving “the rest of their substance to their babes,” exclaimed “As for me, I will behold [the Lord’s] face in righteousness: I shall be satisfied, when I awake, with thy likeness” (Psalms 17:14, 15). John, in an earlier year, exclaimed: “now are we the sons of God, and it doth not yet appear what we shall be: but we know that, when he shall appear, we shall be like him; for we shall see him as he is” (1 John 3:2). Isaiah, describing the intense happiness of the last day saints who witness Christ’s actual coming, declares they will exclaim: “Lo, this is our God; we have waited or him, and he will save us: this is the LORD; we have waited for him, we will be glad and rejoice in his salvation” (Isaiah 25:9). But, unless “his name,” representing Christ’s character, “shall be in their foreheads,” they, like “the kings of the earth, and the great men, and the rich men, and the chief captains, and the mighty men, and every bondman, and every free man, [will hide] themselves in the dens and in the rocks of the mountains; And [say] to the mountains and rocks, Fall on us, and hide us from the face of him that sitteth on the throne, and from the wrath of the Lamb:” (Revelation 6:15, 16). Here John reiterates, from the previous chapter (see Revelation 21: 23, 25), the absence of literal darkness pervading the city. To us, in our present state of being, such a situation seems exhausting and we would crave a quite dark place to find retirement. But incredibly, in spite of being “no night there” “None will need or desire repose. . . We shall ever feel the freshness of the morning, and shall ever be far from its close.” In other words, we won’t ever get tired! In our present state at least a third of our lives are spent in bed oblivious to all that is going on, an incredible waste of time. But sleep, because of our physical limitations, is an absolute physical necessity. Without adequate rest, our bodies simply shut down. Not so in heaven nor in the new earth. Then, sleep will be obsolete! Not a minute of infinite time, reigning “for ever and ever,” wasted in unconsciousness. Neither will it be a constant rush of feverish activity. Rather we will have time to reflect, meditate and relax while conversing with each other and with God for “it shall come to pass, that from one new moon to another, and from one sabbath to another, shall all flesh come to worship before me, saith the LORD” (Isaiah 66:23). This is still the plague-bearing angel assuring John, whose long life was a series of adversities and thinking these things were too good to be true, needed to be told they were “true and faithful.” In other words, they were real. But, they were not just the words of the angel, they came from “the Amen, the faithful and true witness, the beginning of the creation of God” (Revelation 3:14). He, the rider of the “white horse,” is “called Faithful and True, and in righteousness he doth judge and make war” (Revelation 19:11). But, not to “make war” for the sake of war, but to “make all things new” (Revelation 21:5). In that context, John referring to “the Lord God” having “sent his angel” suggest this “angel, referred to as “he” at the beginning of this verse, was working in harmony with the Holy Spirit and “he” should not be regarded as the Holy Spirit Himself. So, once again we are reminded that “time,” from the perspective of heaven is far different than ours. However, as we already noted, “time (whether it be 70 or nearly a thousand years)” ceases to exist for each person when he falls into the grave. The next moment of awareness will bring him/her face-to-face with his God either before the millennium or after. Whichever it turns out to be, it will be soon, not only from the perspective of heaven, but from the perspective of the person himself when consciousness is restored by the resurrection. From that point onward, “time” will become infinite leaving the entire sinful period of earth’s history dwindling into nothingness from the perspective of a trillion years in the future. The words of verse 6 came from “one of the seven angels which had the seven vials full of the seven last plagues” (Revelation 21:9) showing John “the things which must shortly be done.” Here, as if to confirm what the angel just said, Jesus Himself declares “Behold, I come quickly” reiterating what He said at be beginning of the vision: “Blessed is he that readeth, and they that hear the words of this prophecy, and kept those things which are written therein: for the time is at hand” (Revelation 1:3). But, those words, spoken almost 2,000 years ago, tempt us to believe “My Lord delayeth his coming” (Matthew 24:48 and Luke 12:45) not realizing the next moment of time could find us in the grave. We must realize nobody is guaranteed the future whether it be the next year, month, day, hour or even the next minute! As soon as we lose consciousness, “time” takes wings at warp speed. Verse 8: And I John saw these things, and heard them. And when I had heard and seen, I fell down to worship before the feet of the angel which shewed me these things. This verse contains two sentences. The first sentence, affirming that John actually “saw . . . and heard” these “things,” applies to the entire vision from chapters 1 to 22. In it all, he simply wrote down what he “saw” and “heard,” not what he concluded after plumbing the depths of Old Testament writings that were available to him in his time. Note that “the angel” showed him those “things.” He did not conjure them up out of his own learning or imagination. If the angel was quoting Jesus in verse 7, we could forgive John for mistaking him to be Jesus instead of the “angel.” On the other hand, if it really was Jesus who spoke those words between verses 6 and 8, it would still be easy to see how John could have been confused. This is an implied warning for us because the time is coming when the whole world will be deceived on that point saying “’The angels from heaven have spoken to us (referring to those whom Satan personated that had died, and they claimed had gone to heaven). You will hear the testimony of the heavenly messengers.’ They sneered, they mocked, they derided and abused the sorrowing ones.” They will have actually seen and heard “angels from heaven,” but they will have fallen from heaven and been sent by Satan. “We have been given a message exceeding in importance any other message ever entrusted to mortals. This message Christ came in person to the Isle of Patmos to present to John. He told him to write down what he saw and heard during his vision, that the churches might know what was to come upon the earth.” The study of this book received Christ’s unqualified endorsement when He declared: “Blessed is he that readeth, and they that hear the words of this prophecy, and keep those things which are written therein: for the time is at hand” (Revelation 1:3). Although I am reluctant to say anybody who refuses to study Daniel and Revelation will be lost, the words of the prophet seem to indicate that to be the case. Close study reveals they are also applicable to the time when Jesus, depicted as “another angel came and stood at the altar” and “filled it with fire of the altar, and cast it into the earth” (Revelation 8:5). They also apply to the time when the “two witnesses” “shall have finished their testimony” (Revelation 11:7) just before one “like unto the Son of man” took His place on the great “white cloud” (Revelation 14:14). Then, all will have been subjected to “the hour of temptation, which shall come upon all the world, to try them that dwell on the earth” (Revelation 3:10) when the “fifth seal,” (Revelation 6:9-11) the “image of the beast” “test”), was opened signaling that the judgment of the living, the final stage of the investigative judgment, had begun. Then, in order for the “unjust” to be “unjust still,” the “filthy” to be “filthy still,” and the “righteous” to “be righteous still,” the “holy to be holy still,” time, in a post probationary setting, must linger on to demonstrate to the universe that the “unrighteous” really are “unrighteous,” and the “righteous” really are “righteous.” That is exactly what the trumpet scenario is all about. It is a “test” of the living “unrighteous” and the living “righteous” because it transpires before the resurrection. During that time, the “unrighteous,” among other things, will deify Satan, either as Wormwood or Abbadon, which is the same temptation that came to Christ in the wilderness when Satan proposed “All these things will I give thee, if thou wilt fall down and worship me” (Matthew 4:9). The “righteous, “ on the other hand, “keep the commandments of God” (Revelation 12:17; 14:12) and will, like Jesus say: “Get thee hence, Satan: for it is written, Thou shalt worship the Lord thy God, and him only shalt thou serve” (Matthew 4:10). So, they will reject Wormwood and Abaddon in spite of all his satanic majesty can do to embarrass and discourage them. Furthermore, they will “have the testimony of Jesus Christ” (Revelation 1:2,9), the “testimony” given John to the seven churches” while he was on the “isle that is called Patmos” (Revelation 1:9) and “written especially for the last church.” It, among other things, reveals who Wormwood and Abaddon are, for they are an important part of Satan’s strategy during that crucial period of earth’s history to frustrate the entire plan of salvation. If the “righteous” fail to remain “righteous still” during that time, all will be lost. Satan knows that, and is laying is plans deep to make sure they do fail! But, God, through the message He gave John, forewarns us. The prophecies of Daniel and the Revelation have an important part to play in God’s strategy in favor of His people. This will be bad news for the “unjust” and the “filthy” but, good news for the “righteous” and the “holy.” From this point on, the “unjust” and “filthy” will never have the option of becoming “righteous” or “holy.” On the other hand, the “righteous” and “holy” will forever have the option of becoming “unjust” and “filthy” if they so chose for Christ died to set us free and has no interest in forced obedience. One thing only will prevent a repeat crisis or another war in heaven: “our Redeemer will ever bear the marks of his crucifixion.” That alone will be sufficient to prevent another war. In that manner, God “. . .will make an utter end: affliction shall not rise up the second time” (Nahum 1:9), not because it cannot, but because the righteous and holy will not. Perhaps God will cast the “book,” depicted in chapter 5 which “contained . . . the influence of every nation, tongue, and people from the beginning of earth’s history to its close,” into the “lake of fire.” Its record will no longer be needed. Once again, the promise of verse 7 is reiterated then again in verse 20 reminding us we should always consider Christ’s coming from heaven’s perspective of time. His coming, in reality and from the Biblical understanding of the state of the dead, will always will be soon. As we noted before, time ceases at the very moment of death. At the very next moment of consciousness, Christ will be there either in peace or in judgment when all will be raised together because none will precede his neighbor into heaven (see 1 Thessalonians 4:15). While there is some doubt who was speaking in verse 7, whether Christ or the plague-bearing angel, that Christ is speaking here and in verse 12, seems indisputable. The angel who refused John’s worship in verse 9 would not claim to be “the first and the last,” One with whom all things originate and all things end because the angel is a created being while Christ, the great “I am” (see Exodus 3:14 and John 8:58, 59), is self existent. Such juxtaposition of speakers is seen often in the book of Daniel where Jesus and the angel Gabriel are frequently heard speaking one after the other. While Gabriel is not mentioned by name in the book of Revelation, it is not unreasonable to assume he is the “strong angel” depicted in Revelation 5:2. But, there is no doubt about the One who claims to be the “Allpha and Omega.” It is “Jesus Christ” who made that claim at the beginning of the vision right after John announced that He would come “with clouds; and every eye shall see him . . .” After that he heard the same “great voice” “behind him . . . Saying, I am Alpha and Omega, the first and the last: and, What thou seest, write in a book, and send it unto the seven churches . . .” (Revelation 1:1, 7, 10, 11). Then after saying “It is done” he repeats the same claim: “I am Alpha and Omega, the beginning and the end” in chapter 21:6, which basically concludes the vision. This is the seventh and last time the word “blessed,” or “happy,” is used in Revelation. In verse 7 it pertains to those who keep “the saying . . . of this book.” In Revelation 20:6 to those raised in “the first resurrection.” In Revelation 19:9 to those “called unto the marriage supper of the Lamb.” In Revelation16:15, to those who watch, and keep their “garments” clean. In Revelation 14:13 to those who “die in the Lord from” that point forward. In Revelation 1:3 to the those that read and understand “the words of this prophecy, and keep those things . . .” in their heart. Note that two (see Revelation 1:3 and 22:7) of the seven “blessings” come particularly to the saints who read, study and understand the book of Revelation emphasizing the great importance God has attached to its study. Note the personal pronoun “his,” meaning that the speaker is again, as in verses 6, 9, and 10, the angel who “carried” John away in the spirit to a great and high mountain . . .” (Revelation 21:10). This angel had been watching the trend of human developments and knew without question, that doing God’s “commandments” brings true joy, peace and happiness. But, they are not the angel’s commandments, they are “the commandments of God” (see Revelation 12:17, 14:12), the One who just spoke and made the claim of verse 13. Finally, regaining “right to the tree of life” which was denied way back at the beginning of time when God “drove out the man” from the garden of Eden with “a flaming sword which turned every way, to keep the way of the tree of life” enabling those who partake to “live forever” (Genesis 3:22, 24), is now put back in its scabbard. It would have been cruel if God had He permitted “right to the tree” after man sinned. Man could not have handled an eternal life of sin. He would have been like the “men” who were “tormented [only] five months” to the point that they longed for “death, and shall not find it’ and [desired] to die, and death [fled] from them” (Revelation 9:4-6). In other words, man would have created his own hell because “sin” is a torment in and of itself. Death, unknown to the universe until that time, was God’s way of preventing a far worse scenario than what we see even today. These “dogs” are metaphoric for the “filthy” and “unjust” spoken of in verse 11. They are like animals who seek out that which is detestable and disgusting even when pure and desirable things are available. Some years before, Jesus said: “This is the condemnation, that light is come into the world, and men loved darkness rather than light, because their deeds were evil” (John 3:19). The “dogs” are “without” the city because that is where they chose to be, not because God arbitrarily excluded them. Therefore, all people, according to their preference, will receive like condemnation as “sorcerers, whoremongers, murderers, idolaters, and whosever loveth and maketh a lie” if that is what they love to be and to do, instead of loving God’s “commandments.” His “commandments” are the great “schoolmaster to bring us unto Christ, that we might be justified by faith” (Galatians 3:24) and finally, be given eternal life when we can handle it. This time, it is obviously Jesus speaking, while in verses 7, 12 and 13, it was less obvious. Here, He is authenticating the words of His “angel” who “carried” John “away in the Spirit, and set [him] on a great and high mountain, and shewed [him] the holy city, Jerusalem, coming down out of the heaven from God . . .” He even “had a golden reed as a measure, that he might measure the city, and its gates, and its wall” in order to convince John these things were real. Then “he shewed [John] a river of water of life, bright as crystal, going out of the throne of God and of the Lamb” and many other wonderful things. “And he said to [John], These words are faithful and true; and the Lord God of the spirits of the prophets has sent his angel to shew to his bondmen the things which must soon come to pass. Then, Jesus says “I . . . have sent [this] angel to testify unto you these things in the churches,” the things “thou seest” which you are to “write in a book” (Revelation 1:11) called “Apokalupsis” or “The Revelation of Jesus Christ” (Revelation 1:1). Thus, we see here Jesus Himself authenticating, not only the words of the “angel, but the entire “revelation recorded in the Apocalypse” from chapters 1 to 22. Then, as if to reassure John He was really Jesus, He declares He is “the root and the offspring of David,” meaning He not only created David, but became his Son! John, of course, immediately remembered Him as “the Lion of the tribe of Juda, the Root of David” (Revelation 5:5) who appeared while he was weeping “much, because no man was found worthy to open the book” (Revelation 5:4) “of the history . . of all ruling powers in the nations” and “the influence of every nation, tongue, and people from the beginning of earth’s history to its close.” Then when Jesus “took the book out of the right hand of him that sat upon the throne,” John ceased weeping because, now there was hope for the world. He probably joined with the angels “saying with a loud voice, Worthy is the Lamb that was slain to receive power, and riches, and wisdom, and strength, and honour, and glory, and blessing” (Revelation 5:12). Jesus then identifies Himself as “the morning star,” not to be confused with Satan, the “star” fallen “from heaven” and “given the key of the bottomless pit” whose metaphoric names are “Wormwood” and “Abaddon” or “Apollyon” (see Revelation 8:10, 11; 9:1, 11), representing two, postprobationary Satanic counterfeits designed to engulf and confuse the whole world of believer and nonbeliever alike. Although those counterfeits will appear sometime after the close of probation, Jesus says “he that overcometh” Satan’s delusions even at this present time “and keepeth my works unto the end . . . I will give him the morning star” of hope for the future instead of bitter disappointment and utter destruction. As the Commentary verifies, “The speaker is Jesus. His testimony must be accepted.” His testimony is directed to “every man” who hears “the words of the prophecy of [the] book” of Revelation. Although this admonition against adding “to any book of the Sacred Canon” would be entirely unacceptable, Jesus is particularly protective of the Revelation because it reveals Satan’s last day strategy to deceive “if it were possible” even “the very elect” when “false Christs,” particularly “Wormwood,” and “false prophets” including “Abaddon” will “shew great signs and wonders” (Matthew 24:24). The “plagues” God will “add” to the adders, not only include the “seven last plagues,” but the preceding six trumpet delusions. During that time it will appear that Satan has won the great controversy between good and evil. The book of Revelation offers the most direct protection against those last day Satanic delusions of any of the other books of the Bible, including that of Daniel. We cannot afford to neglect its study. Of course, many honest errors have been made which Jesus does not condemn. But, we are condemned if we refuse the light that reveals the error. That includes me, the author of this study. So, for the third and last time in this chapter Jesus reiterates: “I come quickly: blessed his he that keepeth the saying of the prophecy of this book; Behold I come quickly; and my reward is with me, to give every man according as his work shall be.” Now, He just says: “Surely I come quickly. Amen.” This must have been music to John’s ears! Then, John adds, “Even so, come, Lord Jesus.” That was his fervent heart felt prayer, expressing his deep longing ever since he stood watching Jesus as “he was taken up; and a cloud received him out of [his] sight” (Acts 1:9) more than sixty years before. Although the Revelation was just a vision of the future, to John it was real. It should be just as real to us! Rightly understood, it should be evident at this point, that the message of the book of Revelation conveys extremely important waymarks designed especially for the final generation giving us certain signs of Christ soon coming that will foster an ever increasing sense of confidence and assurance. Christ’s presence with us is guaranteed as long as we are with Him paying close attention to all of his Revelations! “When the testing time shall come, those who have made God’s Word their rule of life will be revealed. In summer there is no noticeable difference between evergreens and other trees; but when the blasts of winter come, the evergreens remain unchanged, while other trees are stripped of their foliage. So the false-hearted professor may not now be distinguished from the real Christian, but the time is just upon us when the difference will be apparent. Let opposition arise, let bigotry and intolerance again bear sway, let persecution be kindled, and the half-hearted and hypocritical will waver and yield the faith; but the true Christian will stand firm as a rock, his faith stronger, his hope brighter, than in days of prosperity.”  God’s gift to us through His servant John in the book of Revelation was designed especially to do just that! Summary of chapter 22: The first five verses of this chapter continues the glorious description of the “new earth” and the city that begins in the first verse of chapter 21. Interestingly, one of the plague bearing angels who also described the “judgment of the great whore” in chapter 17, was the one who gave John a bird’s eye view of New Jerusalem’s descent from heaven and many other associated details about it that take place after the third coming that is concluded in chapter 22. The angel concludes his tour by declaring that “these sayings are faithful and true” as if to reassure John as well as the reader that such wonders are real and not imaginary. Verse 7, containing the words of Christ Himself, is complementary to that of the angel’s in verses 1 through 6 reaffirming what He said to the church in Philadelphia in Revelation 3:11 and repeated twice again in verses 12 and 20 in this chapter that His coming would be soon. After the angel gently reproved John for attempting to “worship before [his] feet” in verses 8, 9, he emphatically asserts that “the prophecy of this book” of the Revelation is not to be sealed up and regarded as unintelligible, a mystery that cannot be understood. He then concludes his words with what is probably the most serious event that will occur in the history of all living intelligent beings, that of the close of probation in verse 11. Afterwards, Jesus in verse 12 and repeating what he said in verse 7, concludes John’s vision in the book of Revelation with His own words identifying Himself as the “Alpha and Omega” just as He did in chapter 1 verse 11, then in 21:6 and here in verse 13. His testimony first delineates those who can enter the city followed by a delineation of those who cannot enter. Then in verse 16 He affirms that He Himself had sent the angel who had just finished his discourse in verse 11 after which He extends the invitation twice to whoever will, to “Come.” Lastly, He gives a warning that should be especially heeded by all who hear “the words of the prophecy of this book” of Revelation not to change, add or subtract anything to it on penalty of suffering the “plagues” referred to therein. In other words, expound it, enlarge it, exegete it, but do not read into it take out what is not there. Therefore, this book is not to be taken lightly for it is the most important message that has ever been delivered to mortals! Probably one of the most confusing sequences is that of the sixth seal scenario of Revelation 6:12 to 7:17 with the “great earthquake followed by three celestial manifestations then the second coming, then the question “who shall be able to stand,” then in chapter 7 4 angels holding 4 winds, then the 144,000, then the great multitude then reference to the “great tribulation” then the saints being led by “living fountains of waters.” Careful analysis, with help from the Spirit of Prophecy, convinces me that ch.6:12, 12 are current history, verses 14-17 are future, chapter 7 verses 1-3 are present time, and verses 5-17 are future. So the sequence begins in history, jumps into the future, then back to the present before ending in the future. The only way it makes sense to me is that the central point is the question “who shall be able to stand.” (Revelation 6:17) Chapter 7 gives the answer plus the reward of the saints. Chapter 8 takes us backwards, in what is now future, but prior to the saints reward. If the “twelve thousand furlongs,” (Revelation 21:16) estimated to be 1,378 miles, is the length of each side instead of its circumference, it would be four times as high! I am referring to the seven seals of Revelation 5 with the first four representing character and behavior, and the last three (seals 5 through 7) representing last day events which will take place sequentially prior to the second coming which marks the beginning of the thousand years. Look at it this way: what will seven thousand years look like after living for seven trillion years? Obviously it will seem like a “flash in the pan.” Seventy or a thousand years will seem like a microsecond. “Warp speed” is faster than light which travels 186,000 miles a second or even the speed of thought. Although it is a fictitious term taken from science fiction, it certainly has application to the perception of “time” and might even be too slow! some have concluded, based on the remarkable harmony existing between Revelation, and the Old Testament, particularly Daniel, that John wrote from that perspective. Not so. He received his impressions directly from what he “saw” and “heard.” Obviously, his informant was the same Spirit that inspired all the other writers of the Bible. Therefore the Holy Spirit, the source of the harmony that exists in its writings, is the real author of the Bible. Only God is omniscient, and I am not a prophet, just a humble Bible student striving to share what the prophecies of Daniel and Revelation mean to me. I recognize with so many figures and symbols employed, differences in viewpoint are bound to arise. Nevertheless, that must not be allowed to discourage us. But, in pursuing this study, at least for Seventh-day Adventists, it seems foolish not to recognize the authority of the Spirit of Prophecy to help us in confirming our conclusions. But, not in their own strength. Even though Christ will have ceased His intercessory ministry, His sustaining grace, represented by “much incense” placed “upon the olden altar” (Revelation 8:3), will keep His people during the trying hour. It is clear that knowledge alone will not save us regardless of circumstances. However, God did not reveal the things in Daniel and Revelation which contain abundant knowledge about the last days, to be ignored. If we deliberately ignore such important knowledge, will God save us anyway??? You answer the question, I cannot. while the other five, “doing his commandments, part in the first resurrection, the marriage supper, keepeth his garments, die in the Lord,” are important, they are repeated only once. 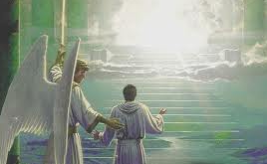 Remember, the gates of the holy city remained open even after Satan was “loosed out of his prison” and went about “to deceive the nations” which were raised in the second resurrection. Only when “Gog and Magog” (see Revelation 20:7-9) actually besieged the city, were the gates closed.